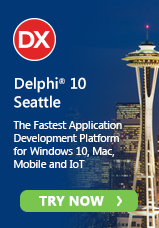 If you have been waiting for a special offer before you buy or upgrade to RAD Studio, C++Builder or Delphi XE6, now is the time to upgrade. Buy One Tool, Get a Second Tool FREE! Offer ends June 30, 2014! For a limited time, with each qualifying Embarcadero RAD Studio, Delphi or C++Builder product you buy, you can choose a second Embarcadero tool of equal or lesser value — FREE! Embarcadero is making it easier and more affordable for you to be more productive. Not all products, editions and license types qualify so check the info page for more details.